At this time of year, I poke fun at the craze to travel far and wide to view “peak” fall color. I remain suspicious that “peak” is a ploy by the tourist industry to lure us up to our mountain counties for a once-in-a-lifetime experience to see all the colors at one perfect location on a single perfect day. I may have caught “peak” one year, but through the fog and rain, I had to imagine it with the leaves clinging to the car windows. This year is different! Driving for the past three weeks on back roads to and from the southwestern edge of Alamance County near Alamance Battleground, I’ve enjoyed a slow subtle progression of colors from greens to all shades of autumn. Last week, the shades were close to blindingly brilliant, so perhaps I’ve caught peak. But on second thought, I’m not sure. There’s still quite a bit of green left on deciduous trees. The many different oaks are just beginning to show some of their red colors deep inside their spreading canopies. 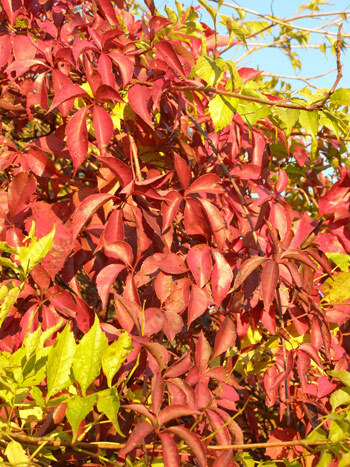 The burgundy-reds of the dogwoods and sourwoods have been evident for weeks, as have some of the shiny-reds of sumacs and red gum. Leisurely strollers around the rolling landscape of Chapel Hill’s Merritt Pasture will have noted colorful mosaic patterns of the gold and yellow tulip poplars, hickories and southern sugar maples on distant forested hillsides. 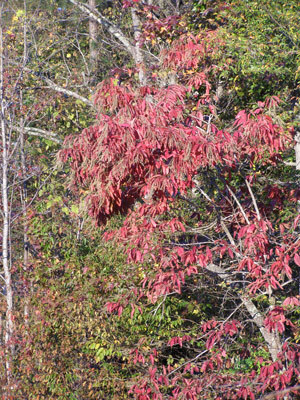 In contrast, one particular red maple out west along N.C. 54 has been having its very own singular peak of bright red for the past two weeks. Maybe we simply don’t have peak around our region, at least not the all-at-once, one-to-two-week show that occurs in the mountains. We all need to keep a sharp lookout for the next week or so, just in case peak really is sneaking up on us from Alamance County. Maybe we can catch it! I have a notion that peak is a condition of the mind, simply a manner of observing. Or perhaps our region has a much longer peak than the mountains. Some of our local dogwoods and sourwoods began turning back in early September, and I promise you there will be spots of peak all the way past Thanksgiving, with some beautiful burgundy and reds of numerous blueberries and sparkleberries. My very own peak this year has been the Virginia creeper, Parthenocissus quinquefolia, unnoticed until recently, turning red within the greenery of the trumpet creeper, Campsis radicans, on the edge of my driveway. Virginia creepers, beginning in late September, are still noticeable everywhere, clinging to utility poles and tall trees, and even climbing up beneath the Columbia Street overpass near the James Taylor bridge. We’re fortunate to have so many “peaks” without having to travel far.